Download Dredd in Digital HD from the iTunes store. 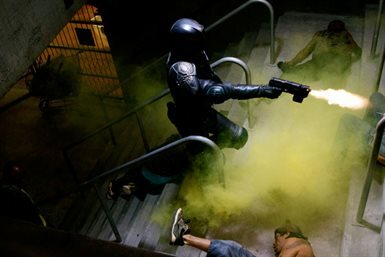 Dredd images are © Lionsgate. All Rights Reserved. Back in the 90's a movie was made called Judge Dredd. Based off the UK comic of the same name, it starred Sylvester Stallone as the title character. But that is not what we're going to discuss here. What we will review is the much better adaptation that hits theaters September 21. It stars Karl Urban, Lena Headey, and Olivia Thirlby. Simply put: it's everything you want in an action film. The premise is easy to follow. Sometime in the future, the majority of the country is a wasteland. The only surviving city, called Mega City 1, runs from Boston straight down to D.C. With such a large area to cover, drugs and crime run rampant. The only form of government is the Hall of Justice which enacts the laws which the cops, or Judges as they're known, carry out. Judge Dredd (Urban) is our titular hero. A man of few words, his actions speak for themselves. If you're hoping to get a good look at his mug in this film, forget it. The helmet never comes off and that makes the movie all the better. His new trainee is Anderson (Thirlby) a young girl with a unique ability to hear thoughts. Their first day out they answer a call about a triple homicide inside a large tenement called Peach Trees. The building, while is inhabited by mostly honest folk, is run by Ma-Ma (Headey), a former prostitute turned drug lord, she runs a tight ship, cooking up a new drug called Slo-mo which severely slows down the brain's perception of reality. When Dredd and Anderson arrest the man responsible for the homicide, Ma-Ma doesn't want them to leave because he can implicate her in the murders. So she has her henchman lock down the building and recruits anyone available to take out the Judges. Thus ensues a barrage of bullets and blood. 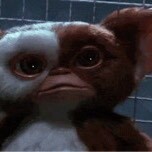 Any fan who lost faith after the first film will feel vindicated after seeing this. Urban really took to this role and his performance as Dredd takes the cake. He said recently in an interview that he took extra steps in preparation by going back to the comics themselves to get a sense of the character. Even before filming had begun he was already walking around in the Dredd costume, again to get a sense of how he would have to move in the suit so that it looked as natural as possible. Clearly, he took the role as seriously as anyone can and knowing that only makes the movie more exciting to watch. Visually the film looks very impressive, the scenes with the Slo-mo effect have an extra pop, seeming to sparkle from the light. The same can be said for the audio, from the opening sequence where Dredd is cruising on his motorcycle to gun fights inside the building, you are assaulted with noise bringing you right into the heart of the action. 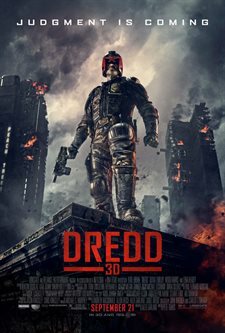 Dredd is the classic action movie that any guy will love, a stalwart man-of-few-words who defines himself by his code of conduct. In a sense, this hearkens back to old westerns, where our hero isn't a lovable goodie-goodie who gets the girl in the end but instead is a man who deals out retribution to those who deserve it and wants nothing in return. His is a life of solitude and he could care less. If you're in the mood for that kind of film, if you're in the mood to leave the theater feeling energized after seeing a great movie then you need to see Dredd ASAP. Dredd images © Lionsgate. All Rights Reserved. Needed some mindless action tonight. Can't sleep. Re watching one of last years best films.